Background:Generic health-related quality of life (HRQoL) instruments measure the overall well-being of people as per their own perspective. Two of the most widely used of these are the Short-Form-36 (SF-36) and the preference-based utility measure EuroQol-5D (EQ-5D). As only about half of all studies are subsequently published and a review of 101 trials found that HRQoL outcomes were the least reported on in journal publications, we undertook this study. Objectives:The HRQoL assessments in industry sponsored antidepressant trials have almost universally been left unpublished and so we undertook an evidence synthesis of raw SF-36 and EQ-5D data from clinical study reports (CSRs) of these trials. Methods:We received CSRs from regulators and all RCTs with either SF-36 or EQ-5D as outcomes were selected and all relevant data were extracted. The concerned pharmaceutical companies Eli Lilly, Pfizer and GlaxoSmithKline (GSK) were contacted for the journal publications of these trials for comparison and for the missing data. 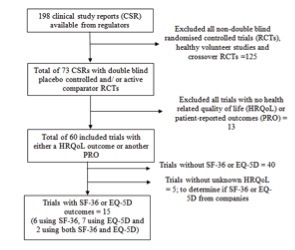 Results:15 trials used SF-36 and EQ-5D as outcomes corresponding to 19 015 pages of data from 8 trials of duloxetine, six trials of paroxetine and 1 of setraline. One other sertaline trial and 4 venlafaxine trials used unnamed HRQoL instruments and no results were available. Four of the duloxetine, 2 of the paroxetine and the sertraline trial from the included trials either were missing or had incomplete HRQoL results. All companies were contacted several times. Eli Lilly submitted the articles almost immediately but no additional data. Pfizer eventually replied stating they would send the articles and missing results but we received neither. We never received any response from GSK. We undertook the evidence synthesis with the limited data we had. Conclusions:Overall HRQoL did not show significant improvement compared to placebo and there was selective reporting in articles and in CSRs.